Last month I decided to celebrate my raise with a trip to Atlantic City. Round-trip bus fare from Washington, D.C., is $25, which is reimbursed by $25 worth of tokens upon arrival. Of course, my initial destinations, and those of my tokens, were the computerized slot and poker machines. After three hours at the machines, I had done extremely well—I only lost $12. The remainder of my time was spent waiting for one of the nickel machines to become available. At home I gamble in a different way, and this month's disk includes two games I have grown fond of: Realistic Video Poker, which will enable you to bone up on your casino video poker skills, and Dominoes from Mulsoft, which will allow you to practice your hand-eye coordination. 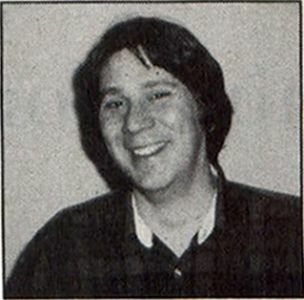 Scott Foust has made available, via the shareware media, a game whereby you can lose your shirt in the comfort and privacy of your own home. Realistic Video Poker, Version 2.2., is a well-written, nicely presented clone of the popular casino video poker game. It features excellent graphics, fast play and an alternative to travel time and cost. After entering "M" to receive $20 in quarters, a 15-second "commercial" for the shareware package is displayed in the hope that the owner of the disk will decide to support the programmer for his hard work. 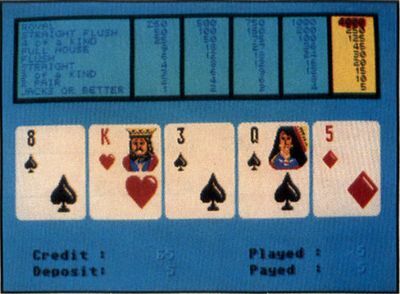 The upper-left portion of the screen shows the possible winning consequences for a royal flush, straight flush, four of a kind, full house, flush, straight, three of a kind, two pair and a pair of jacks or better. The results are displayed for stakes of one through five coins across the top. The bottom of the screen keeps track of the essentials—the amount currently credited to the player's account, the number of coins deposited and the number of coins played and won during the last round. The player determines the number of coins to play by pressing the letter "C," which drops a single coin. Each time this key is pressed, the column at the top representing the potential earnings is highlighted in yellow. If the player decides to enter less than five coins, pressing the space bar deals the cards. Entering the letter "F" plays the maximum, five coins. Upon receiving the hand, the player must determine which cards to hold and which to discard. This decision is made by entering the corresponding card number, one through five, of the cards to hold. In deference to the mouse, this method is faster, easier and closer to that used by the machines in Atlantic City. When the space bar is pressed, the cards not chosen to be held are flipped over and replaced. If the remaining hand yields a pair of jacks or better, the player wins. The amount of winnings is reflected by the strength of the hand and the number of coins played, as highlighted at the top of the screen. The reward for supporting his efforts (sending in your donation) will come in the form of Version 3.0, which promises to include digitized sound, Double-Down, New Deck, Cash-Out to scoreboard and a report of all hands played, as well as the removal of the 15-second commercial. As this month's theme is games, I had to include a favorite of mine and my two children, the monochrome game of Dominoes from Mulsoft. This game is a test of both fast thinking and joystick skill. The game begins with a blank screen and two dominoes drawn across from each other. The action starts as both dominoes are set in motion, leaving a trail of dominoes on the screen. The computer controls one, and the player's joystick controls the other. The object becomes apparent rather quickly: Lay the dominoes in such a pattern that the computer runs out of room to place dominoes first. The dominoes can be placed in any direction, as long as a position already claimed by another domino is not challenged. If the computer is forced to move onto an already-occupied position, the player is moved to the next level and awarded 500 points in addition to the number of dominoes laid down. This forces the player to consider not only how to force the computer to run out of room, but also how to lay as many dominoes as possible before this happens. If the computer forces the player into this situation three times, the game ends. The first two levels are quite simple, and an opportunity is given to laugh at some of the computer's poor decisions. By the third round, the dominoes are definitely being set down faster and reaction time needs to improve. 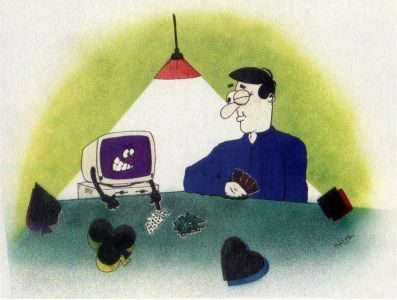 As the fifth round begins, it becomes much easier to make mistakes in spite of some of the computer's questionable moves. Reaching the seventh round forces more respect for the computer. I have only once passed the eighth level, as the dominoes are drawn at a pace I am not able to maintain. If you want nonviolent action that begins simple and ends impossible, Dominoes will help you fill a good deal of your time. Hopefully, you will have a chance to try both of these great games from this month's disk. Remember to remember the shareware programmers!